Wake Up From Your Breakup! Trapped in a Loveless Relationship? Not Getting Results with Your Love Life? Need a Love Tune-Up for Your Current Relationship? When You’re Serious About Finding True Love, It’s Time to Call Renée! If you are on this page you’re probably experiencing a challenging love dilemma or are ready for some guidance to get you out of a funk! I am committed to helping you to Get Real about LOVE & Reinvent Your Love Life no matter what’s going on in your life right now! Have no fear The Love Designer is here! I offer a very personalized and customized approach to relationship coaching to help you detect the real obstacles blocking you from finding your true match. We design a step by step plan specifically tailored for your unique situation. I have helped thousands of people reinvent their lives and open their hearts to love again. Once someone is aware of their patterns, they can transform them and reach their ultimate goals. They just have to be willing to Get Real and commit to their heart! After successfully coaching thousands of people and finding true love myself, I know my very direct Get Real Love advice is the answer you’ve been looking for! What Type of People Do I Coach? Most of my clients are successful and driven super men or wonder women getting back in the dating game after a break up or divorce. Some of my clients are just too busy to find love and end up dating unavailable partners to fill the void. Some are inexperienced daters who can’t seem to attract the right partner. Many of my clients have broken hearts, so I help them rebuild their confidence and offer a variety of services to help them achieve their goals. I am here to help people Get Real and not waste time in unhealthy relationships. I also work with couples experiencing challenges in their relationships! Check out my Couples Coaching information. I’d be honored to help you with your dating & love challenges NOW in person, by Skype or by phone! Let’s get you in touch with your heart, back in the driver’s seat and empowered. I offer various coaching packages and if you are curious but not ready to commit to a few months of coaching, I’d invite you to meet me for a One-Time Love Design Session. Take a look at my Menu of Services to help you focus on the services you may need for your session. This personalized Love Design session also includes a recording of our session and a signed copy of Renée’s new book, Get Real about Love~The Secrets to Opening your Heart & Finding True Love, a heart and vows. Contact Renée at the office or by email and we can set up your session today! Let’s create your new love story! Ready to dig Deeper & Reinvent Your Life? Still Single & Frustrated? Get Ready for LOVE! Wake Up From Your Breakup! Get Back in the Game! Trapped in a Loveless Relationship? Plan Your Great Escape! The Love Reinvention Packages can be customized to meet your unique situation. Each package focuses on different types of love challenges. I also provide Couples Coaching to help partners who are going through break ups, makeups and shakeups. Helping you to get over a Broken Heart and using Healing Techniques to complete relationships. Getting Real about what blocks you from finding or keeping love in your life. Designing a powerful online profile that get results! Preparing you for photo shoots and setting you up with the best photographers for dating head shots. Updating your wardrobe and style to enhance your professional and social life. Expand your social network and where to go connect with successful singles. Mastering your communication skills on the phone and on dates. Learning Renée’s magical “Flirting with Life©” techniques to help you connect and build a strong rapport! Developing more confidence and charisma with communication skills that work! Conversation ice breakers and questions to ask that make you the most appealing to your dates. Look for the signs to discover if you are a match without wasting time. Creative dates and where to go out in your area to meet available singles. Designing your “LOVE Nest” to set up a romantic and stylish environment in your home to attract love. Techniques to energetically preparing yourself and your attitude (with open, powerful NLP communication skills & personalized hypnotherapy sessions for weight loss, shyness, confidence building). Learning how to ask for what you want in your relationship without scaring your partner away. 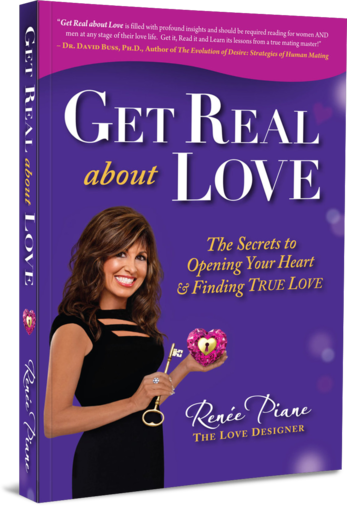 Renée Piane’s “Get Real” phone or in person private sessions assist single men and women in “tuning up” to attract the right people for love, business and friendship. As a dating coach and Love Designer, Renée has helped thousands find True LOVE!